He was born in Chapel Hill, Tennessee, on July 13, 1821. He assumed responsibility for his family at the age of sixteen, following the death of his father. Despite a mere six months of formal education, Forrest rose from semi-subsistence to planter status, acquiring substantial property and wealth, largely through the slave trade. When Tennessee seceded from the Union, Forrest enlisted as a private in Captain Josiah White’s Tennessee Mounted Rifles (Seventh Tennessee Cavalry), along with his youngest brother and fifteen-year-old son. Shortly afterward, Governor Isham G. Harris authorized him to raise a regiment of mounted troops. Forrest recruited and equipped his command, generally at his own expense. In December 1861, in his first major combat experience at Sacramento, Kentucky, Forrest demonstrated the traits of common sense tactics and close-hand fighting that would characterize his military career. In February 1862 Forrest established a reputation for boldness when he led his men out of Fort Donelson rather than surrender. Elected colonel, he led his command at Shiloh, where he was wounded during the Confederate retreat. 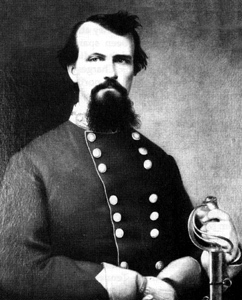 Subsequently, Forrest won promotion to brigadier general after a daring raid against a Union outpost at Murfreesboro in July 1862. In mid-December 1862 Forrest led a raid into West Tennessee that destroyed Union supplies and disabled miles of track and trestlework. The Confederates eluded pursuit until forced into a pitched battle at Parker’s Crossroads on December 31. With the battle almost won, a second Union force appeared, and Forrest was fortunate to save most of his force. Nevertheless, he succeeded in crippling the supply lines over which General U. S. Grant had hoped to support his initial operations against Vicksburg, Mississippi. On February 3, 1863, Forrest’s command suffered a defeat at Dover, Tennessee, while under the command of Major General Joseph Wheeler. Then, following redeeming victories at Thompson’s Station and Brentwood that spring, he stopped a Union raid led by Colonel Abel Streight through northern Alabama in April and May 1863. In his final confrontation with Streight, the Confederate cavalryman manipulated his forces magnificently, convincing the Federals to surrender their numerically superior forces by artificially inflating his own command. Forrest participated in the retreat from Middle Tennessee led by General Braxton Bragg known as the Tullahoma Campaign. In the wake of the Confederate victory at Chickamauga, he urged, but failed to convince, Bragg to pursue the defeated Federals. Resentful of Bragg’s ineptitude and earlier treatment of him, the fiery cavalryman bitterly denounced his superior officer. He obtained a transfer to an independent command in Mississippi and for the third time in his military career created a new command of recruits and conscripts around a nucleus of battle-tested veterans. Promoted to major general on December 4, 1863, Forrest conducted raids against Federal communications and supply lines in Tennessee. In April 1864 he captured Fort Pillow, north of Memphis. In the latter stages of that battle, Forrest lost control of his men. As members of the black and Tennessee Unionist garrison attempted to surrender, an act for which they should have been spared, some of Forrest’s men fired on them. Of the fort’s 585-605 men, between 277 and 297 were killed; 64 percent of these were U.S. Colored Troops. Charges of a “Fort Pillow Massacre” became grist for Northern propaganda mills during the war and plagued Forrest for the remainder of his life. Following Fort Pillow, Forrest routed a larger force of Union infantry and cavalry in June at Brice’s Cross Roads in Mississippi, arguably his finest military feat. In July he helped blunt another Union force at Tupelo, or Harrisburg, where he was wounded while directing the pursuit of retreating Federal troops. He recovered and led a surprise raid on Memphis that produced another Union retreat from Mississippi. In the autumn of 1864 Forrest’s cavalry destroyed railroad and protective blockhouses in northern Alabama and Middle Tennessee. He blockaded shipping on the Tennessee River, disabling and capturing several Union vessels before destroying the Union supply depot at Johnsonville. Immediately thereafter, Forrest joined General John Bell Hood in the disastrous Tennessee campaign of November and December 1864. His rearguard action during the Confederate retreat from Nashville undoubtedly saved the Army of Tennessee from extinction. Returning to Mississippi, Forrest received a promotion to lieutenant general in February 1865 and took command of the cavalry in the Department of Alabama, Mississippi, and East Louisiana. In the closing months of the war, he failed to prevent the capture of Selma, Alabama. He surrendered his command at Gainesville, Alabama, in May 1865. Forrest spent the years after the war struggling to regain the financial status he had enjoyed earlier. He undertook various business ventures, including the presidency of the Selma, Marion, and Memphis Railroad, but he was never able to reproduce his pre-war financial success. Contrary to his expressed determination to remain quietly at home, Forrest soon embraced the Ku Klux Klan, assuming the role of the first Grand Wizard of the secret organization. Through it he sought to restore white conservative Democrats to power. Even so, he never completely adjusted to the new realities of the postwar South. In the 1870s Forrest’s health began to fail, and he died in Memphis on October 29, 1877.